This major work is an affirmation of assurance that takes us on a musical and spiritual pilgrimage through the beloved 23rd Psalm. Singers and listeners will be carried from peaceful meadows to the shadowed valleys, and from the fragile hope of faith, to life everlasting. 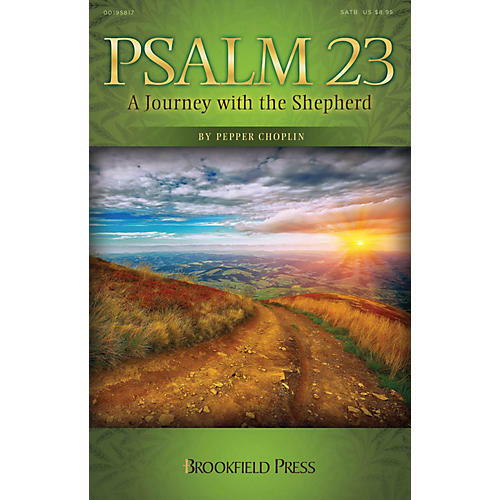 A work of scope and substance, Psalm 23 - A Journey with the Shepherd gives directors a wonderful opportunity to program outside the seasonal box. A glorious orchestration by Michael Lawrence decorates the expressive choral writing with color and a theatrical sweep. Songs include: We Are Not Alone; The Lord Is My Shepherd; Restore My Soul; Lead Me on the Paths of Righteousness; Though I Walk through the Valley; You Comfort Me; My Cup Overflows; We Are Not Alone (reprise); Surely Goodness and Mercy. Score and Parts (fl 1-2, ob, cl 1-2, bn, tpt 1-3, hn 1-2, tbn 1-2, tbn 3/tba, perc 1-2, timp, hp, pno, vn 1-2, va, vc, db) available as a Printed Edition and as a digital download.